Ah, sweet success. After many years of trying the Tangen Tunnel route in winter, Brian and I finally succeeded. And it came on a day when neither of us expected to succeed due to a late start (my fault) and the highest amount of snow we’d ever seen in the Flatirons. But once we neared the top, the prospect of retreating down that snowing, icy hell hole was so horrifying that we continued to push on and finally made it. Heck, we got back to the parking lot with over 30 minutes of daylight. What a great day! We came, we saw, we tried like hell, we barely made it. We started planning the weekend to be our first ski day of the season despite the continuing poor ski conditions (historically low snowbase). But I had a problem with a toe and couldn’t risk death by ski boot. So I left the choice to Brian with a suggestion of the Tangen Tunnel as an “aggressive” alternative. I also indicated, unhelpfully, that I could not do an early start due to a commitment. I suppose I knew that this ruled out success on the Tangen Tunnel route which takes a long time even in good conditions, but that is what came to my mind at that moment. 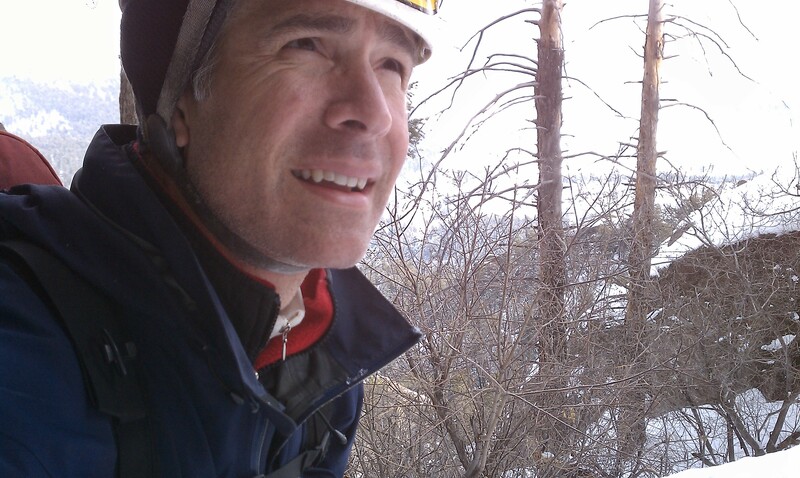 The real problem is that the Flatirons have had so much snow that I just didn’t know what to suggest. Brian picked Tangen Tunnel route. (Me and my big mouth, eh?… at least we’d get some exercise, and be outside). I spent much of my time-constrained morning digging around for my snow gear not seen since the previous spring, and I just couldn’t get to Chautauqua park before 10:15am; but I was better prepared than usual. 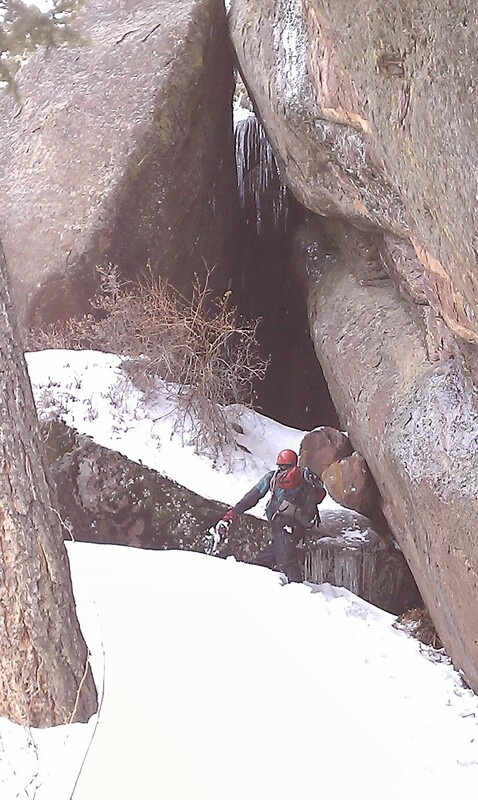 We set a good pace up toward the Royal Arch and reached the bottom of the Tangen Tunnel route a bit after 11am. We could see that we’d be swimming up the route, so we took time to get on all the gear: insulating liner jacket, gators, warm hat, helmet, and harness, and then we set off. 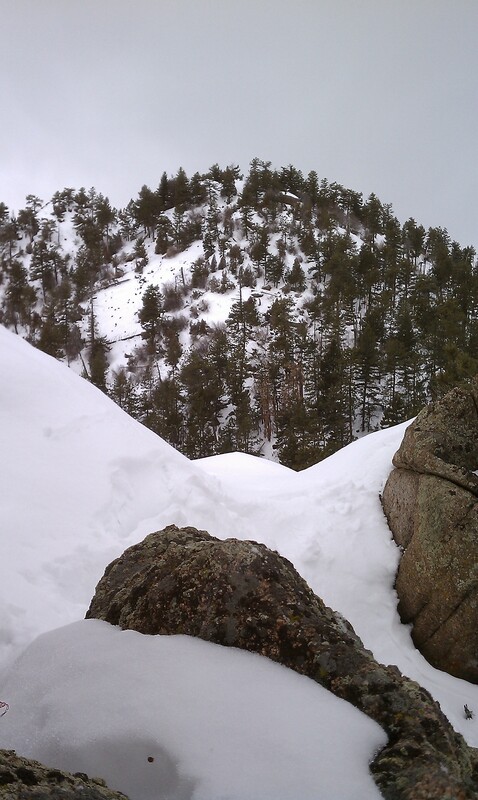 I made it 10 feet before being stopped by a 6 foot tall boulder covered by soft snow. Slipping and sliding, and failing to find purchase on snow flavored air, I eventually resorted to stemming on the icy rock face of Tangen Tower and hooking rock overhead with my ice axe to inch my way over the first obstacle. During the summer, this obstacle represents a barely noticeable, small scramble; on this day it was a 15 minute puzzle. Now we knew for certain it was going to be at least an adventure (but hopefully not an epic one). A climber’s slang term that refers to a big climbing adventure and all the bad stuff that happens on it, like ropes getting stuck, being benighted on a ledge, getting caught in a bad storm, or wandering off route. The rest of the swim to the 1st cave / tunnel was easier, but once inside the cave it was not clear if we would get through it. When I stopped to look around to remember the path upward, Brian started climbing. From 10 feet up, he announced that the obvious path didn’t go all the way; but he did think he could wriggle through a slot to get out. As I watched, he slithered like a snake and was gone. My turn. I followed his path and found I could just squeeze under a hanging boulder to reach the exit hole, but once through I could not safely turn around to crawl out. As I layed there pondering my next move, a rope with a loop tied on the end fell down into the hole. Good ‘ol Brian to the rescue! 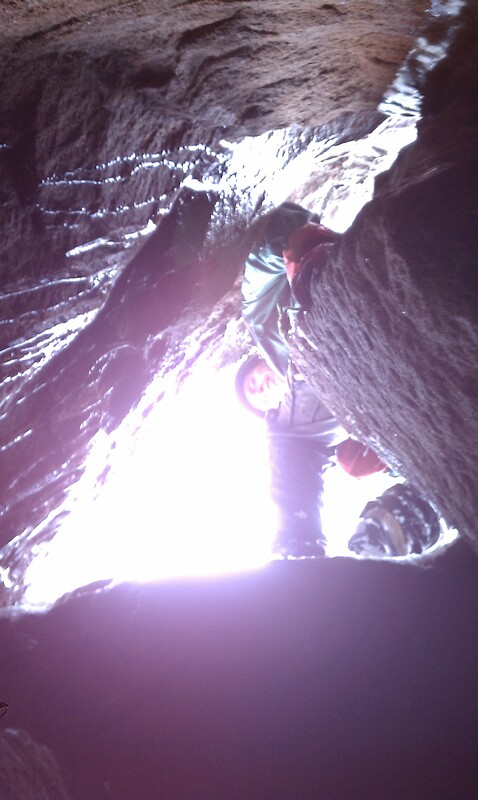 With a secure belay, I managed to maneuver my body around to get a grip on the rock above. I pulled up and then risked weighting a dead branch wedged in the hole. The last required move was a high step onto a packed snow cornice that was supported by naught but air. It held. I glanced at my watch at saw that it was 12:15pm; we had already burned 45 minutes…to travel about 100 feet. Joe contemplating his future while looking at the next section of snowy, icy rock. I then turned and followed Brian uphill, losing a step in the knee to thigh deep soft snow for every two taken. 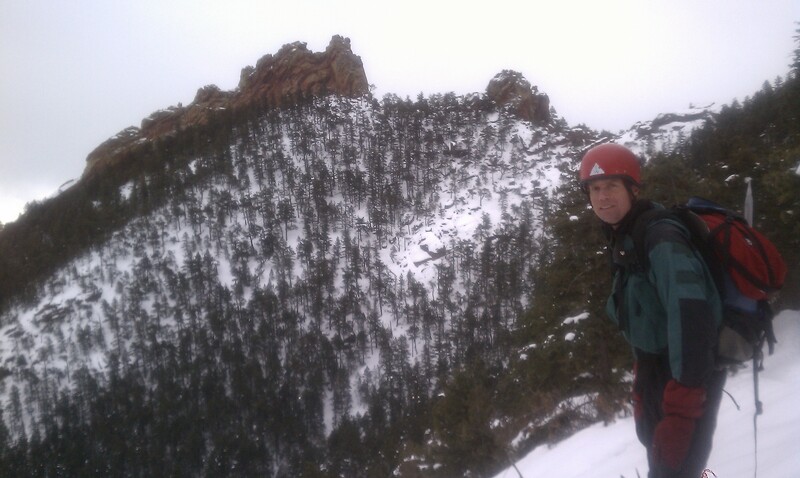 We quickly learned to stay near the 4th Flatiron rock face where the snow was firmer, perhaps due to snow melt dripping down during the sunny days since the big dump. Of course, this was also where we faced the risk of falling icicles, which were falling more and more as the sunshine did its work high above us. As a side note, I always have a mental image of the Tangen Tunnel route as a narrow gully with rocky obstacles. But somehow I am always surprised on each visit of the wide possible path and the myriad of choices that must be made correctly to stay on route. At least I remembered that the key was to ‘bear left’…a lesson learned by trial and error over the years. Post Script: having just returned to the Tangen Tunnel route (2 months later) I can report that it is a narrow gully with rocky obstacles that appears to be a wide open space when all the rocky obstacles are covered by a thick blanket of white, white snow. There are few options for completing the Tangen Tunnel route; perseverance is required in all cases. 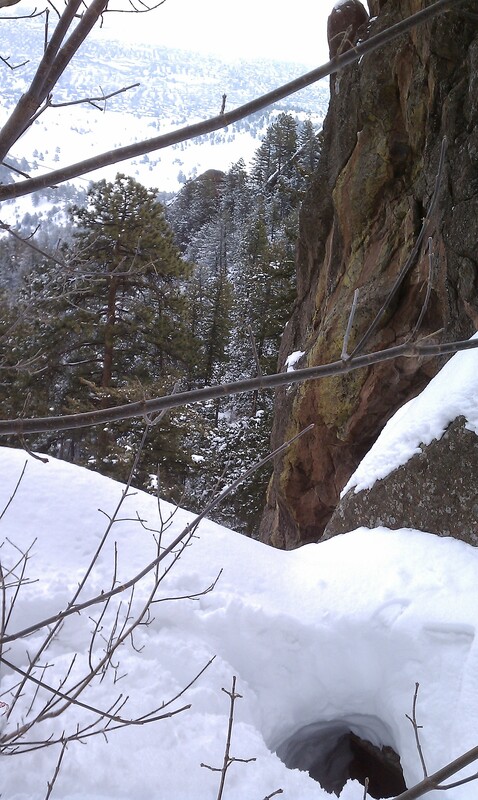 Just past the start of the 2nd piece of the 4th Flatiron, we came upon a tiny cave entrance. Brian ducked into the small entrance as I approached. By the time I crawled to the back of the cave, Brian had crawled out of the 2nd rabbit hole, leaving his pack behind to make his escape. I handed up his pack and then mine, and then it was my turn to slither skyward. 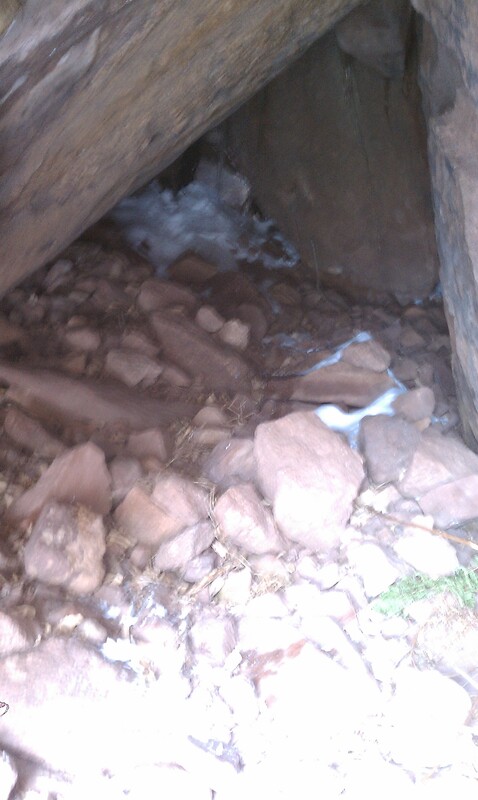 I found that a layer of clear ice covered much of the rock, and snow falling from above covered the rest. I got Brian to give me another belay and then made the slippery moves to crawl out. As I pulled my head above the snow surface, I saw a block of ice the size of a soccer ball plunged from the rock above into the snow 4 feet from Brian. It was an off-target kill shot. All Brian heard was a muffled but insistent, ‘WHOMP’, as the deep snow cushioned the impact. 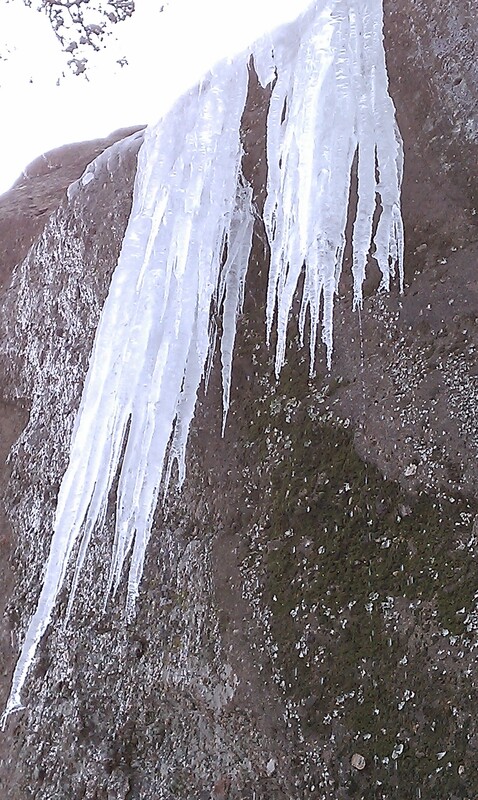 The sun was warming and now sufficiently loosened the ice on the exposed rock above; it was time for extreme caution. And, not wanting to stand in any one place too long, we quickly packed everything away and then continued our ascent. It was 1pm, and time for a lunch break…if only we could find a safe & dryish place to stop. 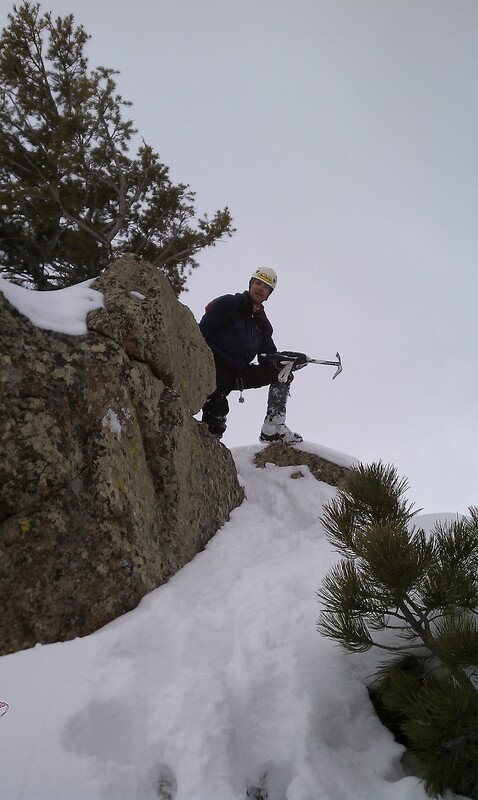 We continued up the soft snow, overcoming many snow-covered rock obstacles along the way. Before long we could see another cave in the distance, in a section of rock that seemed to block our path. From a distance, the 3rd cave looked much better than the 2nd cave, but we didn’t recall crawling out the back of this one before. As we got close, it became clear that the cave was not a part of the path as it wasn’t a ‘tunnel’. But we could skirt it by taking a steep ramp to the left, and it did look like a dry place to sit without fear of falling icicles. After a bit of deft icy rock scrambling and rock hooking, we settled down for a rest and lunch. It was 1:30pm. Brian approaching ‘Lunch Cave’…a surprisingly dry and safe spot to rest and refuel. Finally, we could add some fuel to the fire. I had purposely brought no more food than I thought I needed to keep from eating extra for no reason. Unfortunately, I didn’t leave room for a ‘need more food’ scenario. I ate my 2 bars and drank a liter. Now it was just a race to the top (and then bottom) with the sun, hoping not to bonk along the way. I mentioned that I hoped we could make it to the top to avoid the ugly series of rappels we were doomed to take on the retreat. Brian reluctantly admitted a lack of confidence in our chances. I had to admit that the late start didn’t help. And, just at that moment, as I was looking out of the cave entrance, facing down the mountain, a 100 lbs collection of icicles I had admired (and photographed) over my head a few minutes earlier came crashing down…right onto our tracks in the snow. Wow. Despite the excitement, sitting on a cold rock, even a dry one with overhead shelter, doesn’t work for long on a cold day. We left after 10 minutes. Crawling up and over the escape ramp turned out to be very hard. We succeeded only by discovering that we could sink our ice axes into the rotting wood of fallen trees and then pull up to gain a bit of altitude. Thunk, thunk, thunk, and then we were past the ‘Lunch Cave’. I think it is fair to say that this technique plus the ability to hook rocks beyond arm’s reach made all the difference between success and slippery futility. The next milestone would be the end of the 2nd piece of the 4th Flatiron. 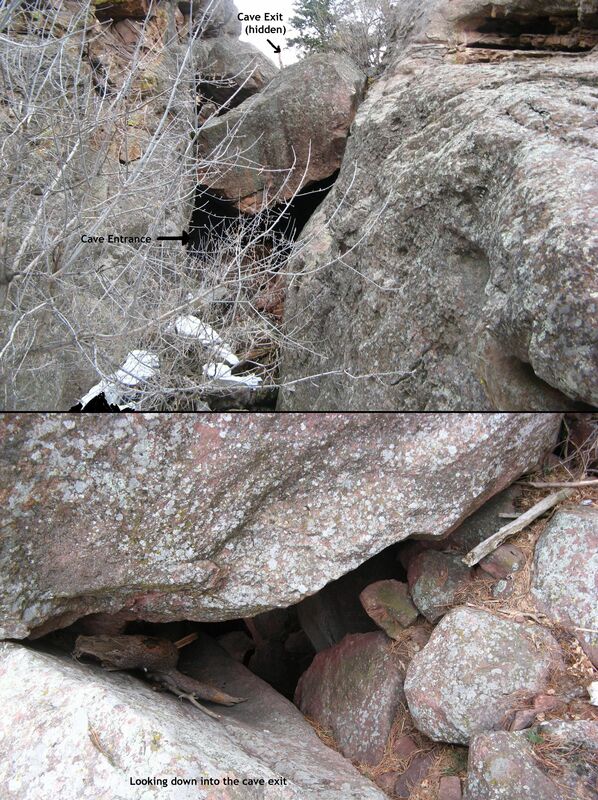 As we approached the end of the 2nd piece of the 4th Flatiron, I recognized another cave that Brian and I had used several years ago on a failed winter attempt. We used the cave to rest and light a small campfire for a bit of warmth while we ate our lunch. At that time we had been lost and decided to turn around to avoid a disaster (‘epic’ adventures make for great stories, but no rational person purposely seeks to experience such days). It was interesting to discover that we were right on route except for the last decision to head right, which we eventually abandoned before returning to the cave. This was also the day when we learned to ‘bear left’ on earlier decisions. It was also the correct choice on this particular route-finding decision. The objective: Green Mountain summit. Passing underneath the start of the 3rd piece of the 4th Flatiron was a challenge. The open space beneath contained thigh deep snow that was too soft to stand on. I suppose it collected all the snow rolling off the steep section of the Flatiron. Whatever the reason, it was the worst struggle of the day; but at least we were safe from falling ice or slipping off icy rock. We could tell that we were nearing the top, but it was after 2pm and daylight was expiring (2-3 hours remaining, at best). Our current plan was to get to the top and see if we could tell where we were, and figure out the best and fastest way down. I mentioned that we had several options if we couldn’t find a path to Green Mountain. I said we could drop down into Skunk Canyon or we could head down toward the 3rd Flatiron. I felt that we could make it down those paths easier than we could our ascent path; but it was clear that the best way was to prevail in finding a way to Green Mountain’s Greenman trail just below its summit, and then follow that trail down to take the Saddle Rock trail to the bottom. The feeling of desperation was evident in our continuing high energy output. Higher and higher, and by finally by 2:30pm we could see down into Skunk Canyon. We had made it to the top of the 4th Flatiron. Naturally, nothing looked familiar. But we reasoned that all we needed to do was hike west, but from every past experience on this section of rock we knew it would be hard. And with the amazing snow cover, it might be impossible. Let’s just say that a high stress level was a reasonable reaction. Now we had to bear to the right, just slightly. And every break in the trees would lead to an examination of the possible paths down. If we couldn’t find our way to the Green Mountain trails, it was going to be a hard night. We kept getting cliff-ed out, and then barely finding a scramble down, we continued making progress toward our goal. And suddenly, everything seemed to be below us. One final outcropping of rock and then it would be an easy stroll to Green Mountain’s Greenman trail. It was only 3pm! And we could see the Green Mountain summit! We were going to make it and with time to spare. There would be no stumbling down in the dark this time. I felt so good that I insisted that I get a ‘summit’ photo. The rest of the route finding was merely an exercise in not losing much elevation, and not gaining much either. I knew that if we looked to the right while we stayed near the ridge line, we’d see a split rail fence marking the trail. And, at 3:15pm, we found it. The Greenman trail was in beautiful condition for an easy, snow cushioned descent. We decided to skip the Green Mountain summit, discretion being the better part of valor. I predicted a 4:15pm arrival at the parking lot and was only off by 5 minutes. It was a 6 hour round trip. I can remember when 6 hours was one-third of the hard day, but I was glad to be driving home. P.S. – I was sore for 4 days. 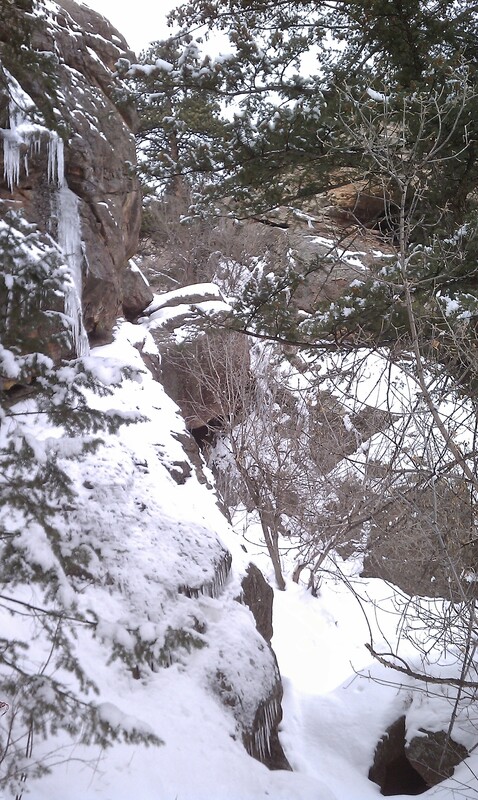 This entry was posted on February 18, 2012 at 12:56 pm and is filed under mountaineering, Trip Reports. You can follow any responses to this entry through the RSS 2.0 feed. You can leave a response, or trackback from your own site.